If you are looking to integrate video chat into your platform, you can use Google Meet as a simple solution. If you are not familiar with Google Meet, you can use it for real-time meetings sharing video, desktop, and presentations with teammates, customers, or your members. Click here to learn more about Google Meet. Note: You will need a Google Suite account to host, anyone can join. Google Chrome is also required. 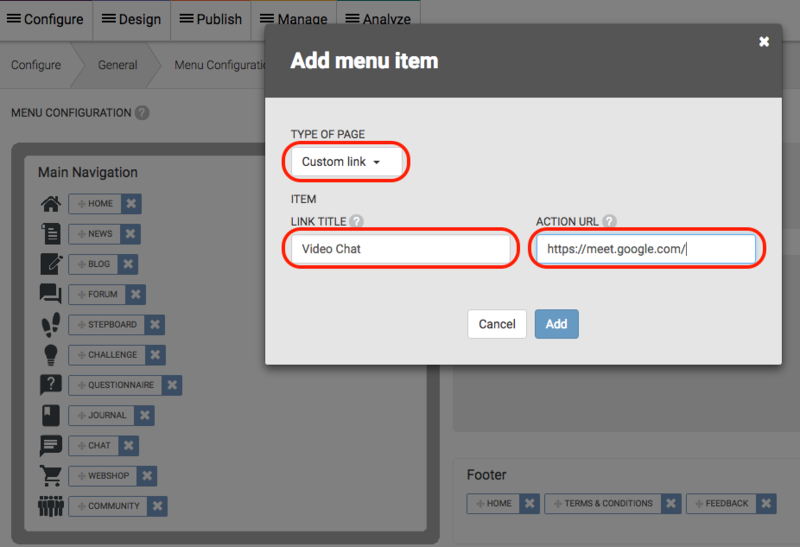 In short, you can either place your Google Meet link within a post anywhere in the platform you’d like, or create a Custom Menu Link within the main menu (Advanced Plan). Please follow the instructions below to add Google Meet to your Menu. Select Add, and save the page. Now in the front-end of your Platform, you should see the Video Chat link on the menu. So, as long as you or any platform member is logged into their Google account and using Chrome, they can either join a meeting or start a meeting (depending on administrator privilege settings). If there are any scheduled meetings in your Google Calendar, they will appear on your respective https://meet.google.com/ page and you can join or start a meeting directly from this page. Want to know what tools you can seamlessly integrate into your community platform?